This week's giveaway would be a great addition to anyone's home library or favorite reading spot. I saw these on Etsy and knew that I wanted to offer these unique creations to my readers. So let me introduce you to Curious Printery, the creator of one of a kind art prints, including many that speak just to readers. Let's check out a few of my favorites. Best part about these prints? Each print is printed on a gorgeous antique Victorian book page and approximately 8" x 10 1/2". Curious Printery has generously offered one of our readers their choice of any print form their collection, which includes over 100 options. Check it out now and leave a comment below to win. Check out Curious Printery and tell me which of her products you like best. Prize includes choice of any print of your choice. Giveaway closes at midnight EST on Wednesday, February 15th. This is an awesome giveaway! I know a few people this would make an awesome gift for (If I didn't keep it for myself. My favorite print is the "Raven Crow reading a book"
Cabinet of Curiosities! Such unique prints, love them! I'm in love! These are fantastic!!!! 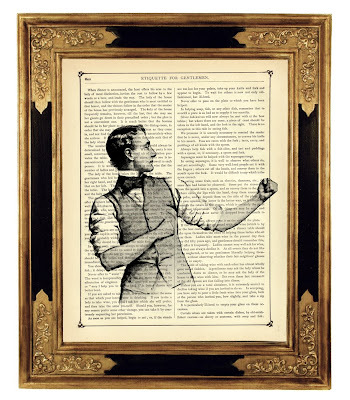 My favourite would have to be the Sherlock Holmes boxer print from Curious Printery. So great! Then again, I love all the Sherlock Holmes ones. Love it! Especially Alice in Wonderland! What a great giveaway—I would love to have one of these prints hanging in my home! 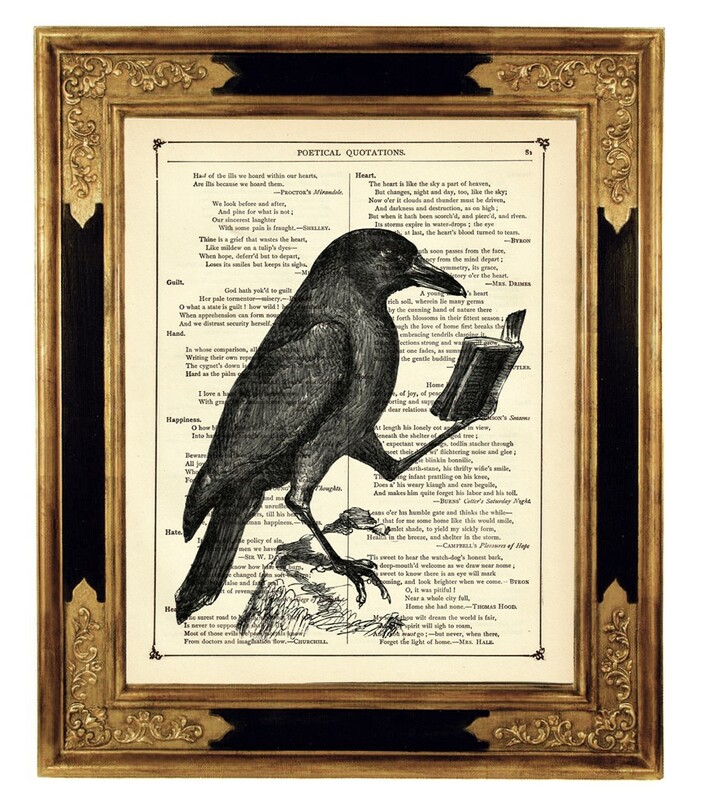 My favorite print is the portrait of Edgar Allan Poe! Very cool art, love it. Thanks for the chance. What a great giveaway. The Alice in Wonderland that you featured is awesome....but the flamingo riding the bicycle just made me smile. Thanks for the chance. Those are absolutely wonderful! They'd look great in my main hallway- especially the Girls playing on a Mushroom print! I would love to have one of these prints to give to my husband. He's a huge reader. I follow via google and this is totally cool. they are beautiful, especially the alice and wonderland one. ho goodness I adore these, so beautiful. These are so cool and unique. This is a great giveaway! Thanks for hosting it. There are so many lovely prints in the shop. The flamingo riding a bicycle is one of my favourites. My favorite is the Marie Antoinette Rococo Baroque Lady Dress Costume. I really love Gentleman with butterflies! Those look so cool! thanks for the givaway. I like the girl catches skull balloons. Thanks for the chance. My boyfriend oves ravens so I'd be tickled pink to win that one for him, but all the octopus/kraken ones are really tempting, too! I'd pick this. SOOOO cute!! I would so love to win - what gorgeous prints! I like the surreal elephants pyramid. I love the Bunny Rabbit holding a red Balloon! Really cool prints - thanks for the chance to win! Fabulous looking pictures. I am off to the etsy shop to have a browse. Couple Lady and Gentleman sitting on a Mushroom - Vintage Victorian Book Page Art Print Steampunk is my fave!!!!!!!!! Thanks for the chance to win one of these gorgeous pieces! My favorite is the Girls playing on a Mushroom print. My walls are mostly bare, and this is the kind of thing that would make a beautiful intriguing difference! These are all really lovely. I think I'm going to need more walls. It was really hard to pick a favorite. (I'm still not sure I've actually done it. I keep waffling between two of the prints.) I think I like Alice in Wonderland and the Dodo Bird best (with the Alice/Dodo print coming in a close second). An awesome giveaway. Thanks for the opportunity. 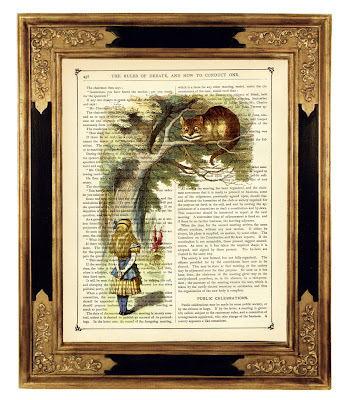 I really like the Girls playing on a Mushroom - Vintage Victorian Book Page Art Print Steampunk. i cannot pick a favorite! I adore all the Alice in wonderland ones, the corsets are beautiful, and I love every single one with an owl or octopi on it! Awww ... those prints are lovely! Perfect for a bookaholic like me :-)! I adore the Alice in Wonderland Drink Me Potion Bottle print! I love the crow print. I'm looking for book art now for my home. I read all the time & would love this. I love the Girl catches Skull Balloons - Vintage Victorian Book Page Art Print Steampunk!! I love these- thanks for the giveaway! I love Vampire Lady with Bat Dress Costume. I follow you on Twitter as handmade4every1. So wonderful! I'd love one!